Jim Jarmusch is cool. Very few would have the misguided nerve to argue against this claim. His writing is cool, his directing is cool and his hair is very cool. His scripts seem to be written with the implicit intent of being undersold while his directing technique routinely undermines flash and outright refuses to sizzle. He often casts musicians like Tom Waits (who might be the epitome of cool) in leading roles and he is never afraid to let a shot linger glacially long enough to outlast contemporary audience expectations of what is appropriate. Jarmusch is cool enough that venues should consider starting his movies an hour after the listed showtime in order to allow the images to arrive fashionably late to the eyeballs. Jarmusch is so cool that 1995’s DEAD MAN plays it’s principal death scene out over the course of at least an hour of running time, making it one of the more laid-back departures ever recorded onto film. Death scenes are usually a free pass for an actor to indulge in some serious scenery chewing but Jarmusch knows how to minimize even the most dramatic of opportunities. When the character finally succumbs to death it feels like a nap that’s been put off for far too long. The movie plays it cool. The titular Ghost Dog of 1999’s GHOST DOG: THE WAY OF THE SAMURAI emulates the Samurai culture. These fashionable warriors of ancient times used to commit suicide without making a fuss over the act. Instead they offed themselves quietly and, again, without over-dramatizing the moment. When conflicts come to a violent head in GHOST DOG the scene plays like more of a whisper than a gunfight. It’s a climax that’s quiet enough for a library. Many of Jarmusch’s most devoted fans revolted against the copious understatement of his last feature, 2009’s THE LIMITS OF CONTROL. That film keeps so much information from the audience that it bends our notions of what constitutes a narrative feature. Jarmusch refuses to emphasize both narrative context and character motivations — two basic elements as important to the substance of a film as hydrogen is to the substance of the universe . The film acts as steadfast proof of his inability to oversell anything. Thankfully, this inability includes vampires. It’s hard to imagine many people will find themselves in Iceland while watching his new film, ONLY LOVERS LEFT ALIVE, but should one happen to be so lucky, as I was while attending a festival screening during a visit, there’s a moment early in the film that kills with the Icelandic people. Our lead vampire, played delicately within the Jarmusch wheelhouse by Tom Hiddleston, meets a doctor, played by Jeffrey Wright, to score some 0-negative. Unfamiliar with Hiddleston’s vampiric lifestyle, the doctor suggests he might want to implement vitamin D into his diet to combat the pale skin. The moment was giggle-worthy for an American like me but for an audience that spends a couple months of every year in complete darkness, as the Icelandic people do, this little quip finds a national chord to resonate with. The packed house in Reykjavik erupted at the line. Admittedly, this was a unique set of circumstances that helped elevate the minor joke’s chances of success but the anecdote works as example of Jarmusch’s ability to garner great poetic effect from even the most unobtrusive moments. It’s a wonderfully insidious brand of rope-a-dope filmmaking he utilizes. He lulls us and then he pounces on us. His eye is naturally comedic but he rarely indulges in straight comedy. ONLY LOVERS LEFT ALIVE is no different. It offers the easy quips and the heady laughs but they are presented in the midst of some pointed social commentary. He manages to straddle this line because his cool isn’t a superficial glaze. His cool is his technique and he uses it in a way that differentiates him from his peers. Even when he works in diverse genres he seems more interested in turning them inside out and implementing his style than conforming to the norms. Think of DEAD MAN, which is hardly the western your father grew up. And while GHOST DOG features plenty of action sequences it would be a sore thumb next to the Van Damme catalogue in the action section of your local video store — if you still had a local video store. When it was announced that he would be tackling a vampire film as his next project I thought it would be wise to temper my genre-induced expectations. To hype a Jim Jarmusch film in any way feels somehow inappropriate. He works best without any type of expectations because you’ll be disappointed when he defies them. If this new effort is his version of a horror movie then it only further reinforces his tendency to eschew genre conventions. To create his vampire iterations Jarmusch cast two of the cooler actors currently working. Not cool in a trendy way, more “cool” because it seems like the actors’ body temperatures never quite reach 98.6 degrees. Tom Hiddleston and Tilda Swinton both radiate a reptilian chilliness that feels uniquely suited for portraying creatures of darkness. They suggest terror and existential dread without the crutch of an exposition-rich script. They also manage to bring real moments of tender humanity to their renditions of inhuman vampires — a feat often attempted in vampire films but rarely accomplished. Vampire horror has been creeping around cinemas for just about a hundred years. Imagine the difficulties a filmmaker faces in attempting to spin a yarn with this vampire ingredient while still managing to make it come off as fresh. Jarmusch manages that very feat. He breathes new life into a genre that has been coasting off cliche for decades. We know that vampires need blood and the source of this blood is a human. We also know that vampires kill humans for this blood. But Jarmusch presents to us the other side of the equation, ignoring the chance to go for some easy violent bits of plot. He doesn’t romanticize the torment of his characters’ bloodlust, their urge is more medicinal. He doesn’t melodramatically wallow in the dynamic of human/vampire love either. He instead shows us the moments that fill the gaps between activity in these very extended lives. Instead of wallowing in pale-faced emotional torment, Jarmusch shows vampires hanging out. He understands that the one thing vampires possess that ordinary humans do not, aside from an aversion to sunlight, is a grand historical perspective. Consider what you would do if you had an eternity to hang out and consume culture. What would you read? What would you watch? Which historical figures would you idolize and which would you choose to besmirch to your vampire friends? If you were around when Tesla was in his prime and then you saw our species now, what sort of opinions would you have? Would you let the centuries pile up until the accumulated despair forces the immortal to consider suicide? Or would you always find the good in a world where the bad often makes its presence known much more clearly? 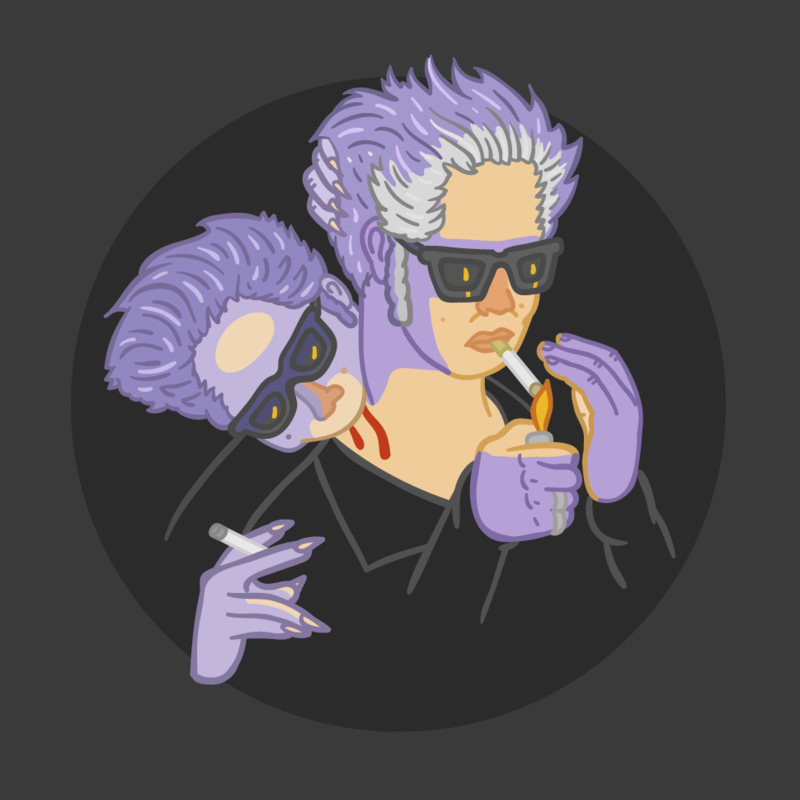 As they sip on their 0-negative, Jarmusch’s vampires discuss these matters. They get excited, they get depressed, they read books, they make music and they dance. Jarmusch lets his vampires pose questions that reinforce and redefine what it means to be human. He twists the genre and bends it to his will. This isn’t to say he avoids all the thrills one would expect it’s just that these moments of fright are doled out with a much more muted effect. When they do occur, the macabre bits mix beautifully with the moments of the mundane. One of the very few moments where teeth are bared is given to us in a context that poignantly strengthens our sense of humanity’s potential, not its failings. This is a life affirming vampire movie about sometimes-depressed vampires. It’s funny, sad, simple and, through and through, it’s Jarmusch. In fact, it’s too cool to be anyone else.